This site is designed to work with Java Script enabled on your browser. All Java Script contained herein is safe. No malicious code is found on our website. 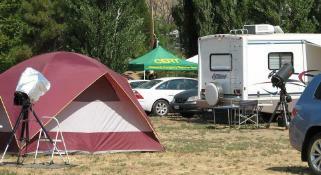 Camping at StarFest will be available for three nights: Thursday the 1st, Friday the 2nd, and Saturday the 3rd. 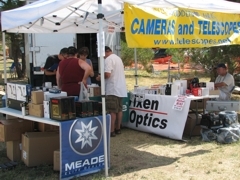 Packing up and departing will take place on Sunday the 4th, with everyone off the property by 12:00 Noon. There will be limited vendor activity on Sunday. Arrival and setup on Thursday can start at 4:00 p.m.
All types of camping are welcome; *motor home, fifth wheel, trailer, tent, back of car or truck. *Additional $25 charge for premium (flat) RV site. As there is a limit to the number of spaces in this area, it is recommended to pre-register to ensure a spot. Once spaces are full, all other RV parking will be on 1st come first served basis. Your "Pre-Registration" camping fee of $40.00 for an adult and $20.00 for teens (13 to 18, kids 12 and under are free), is for the entire three nights, whether you stay one night or three. “At-The-Gate” Registration is also available for an additional $10.00 fee. Included in your registration fee is entrance to the vendor exhibit area for Friday, Saturday and Sunday. Just show your wrist band for admission to the Vendor / Exhibit area. Porta-potties with wash stations will be provided in several areas around the campsite. Dumpsters for trash will also be available. An outdoor shower, at the back of the winery is available to all campers, free of charge, but you must wear a swimsuit. Non-potable water will be available from hoses near the exhibit area. See the GENERAL SITE MAP for location of facilities. The washing of dishes, pots, pans or utensils at the hoses or wash stations, is prohibited. We can take cash, checks or money orders, or credit cards at the gate. Prices are $40.00 for Adults, $20.00 for Teens, Children 12 and under are free. Registration confirmation will be sent by e-mail, along with rules and maps. Please include your e-mail address with all registrations. Campers who miss the preregistration deadline will be able to register in person at the event. 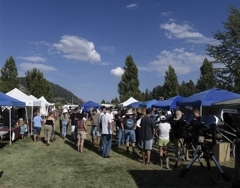 Camping reservations may be cancelled up to 72 hours in advance of the Thursday date of the Annual StarFest for a full refund. Exceptions may be made for bona fide, documented emergencies. Please e-mail us to cancel your reservation and request a refund. Confirmation: Confirmation of your registration, along with these rules and a site map will be e-mailed to you. Upon check-in, you will be given wrist bands for admission to the exhibit area. Site Access: The grounds will open at 4:00 p.m. on Thursday the 1st for camper setup. Do not block the access road while waiting for the grounds to open. The gate closes Thursday and Friday at 8:00, 6:00 p.m. on Saturday. Registration/Check-In to end @ 6:00 p.m. on Saturday. The exhibit area opens at 9:00 a.m. on Friday, 8:00 a.m. on Saturday. WHITE LIGHT IS FORBIDDEN: No white light will be allowed. Please use DIM red flashlights and be careful to point them only at the ground. 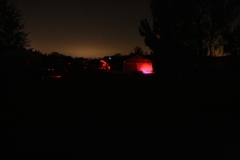 High Energy Red LED Flashlights are just as damaging as a white light, do not use them! If you have a laptop, it must have a deep red filter over the screen or be completely covered by a shroud. If your car flashes it's lights when you lock it, do not lock it or unlock it after dark! If you car has white interior lights, please disable the lights (pull fuses or bulbs) if you need to open your doors at night. Motor Homes: No interior or exterior white light allowed, unless fully concealed. 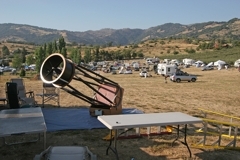 General Public Access: Saturday evening will be the event's "Outreach" time, where the general public will be invited to observe through the telescopes of SDAA volunteers, vendors and fellow campers. 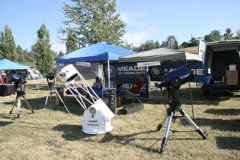 The outreach helps the hobby by opening their minds to the wonders of the heavens. 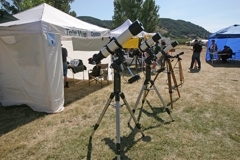 Although we will try and keep the public out of the campsite areas, please be tolerant of them, and if they ask, let them look through your telescope. We will also endeavor to have them off the grounds by 11:00 p.m., so that any white light intrusion they may cause, will be over before the prime viewing time begins. Food: Food and beverage vendors will be available (see site map) Friday evening and during daylight and early evening hours Saturday. Many fine restaurants are available in Julian, just 2 miles away. Most restaurants are open until 8:00 p.m. See our "The Town of Julian" page for a complete list of available restaurants. 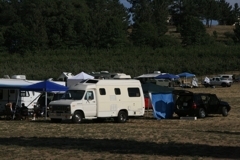 Camping: Space for 200 vehicles, including RV's will be sold. Additional camping is available at William Heise County Park, approximately seven miles away. For other lodging, including Bed and Breakfasts, Hotel and Lodges, see our "The Town of Julian" page for a complete list of available accommodations. Rest Rooms: Portable restrooms, with hand washing stations, as well as trash cans, will be available in the exhibit area and in the camping area. Please keep the area around the restrooms clean. Fire Safety: Outdoor fires, including charcoal fires and white gas stoves, are strictly prohibited (propane is acceptable). Day Use: Those not staying overnight may pay a Day Use admission, payable at the gate. Gates open at 9:00 a.m. on Friday, 8:00 a.m. on Saturday and Sunday. Pets: If you must bring your pet, they must kept on a leash at all times and away from other animals or crowds. 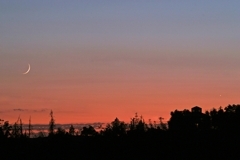 Recreational Vehicles/Camp Sites: The camping and RV area is also the observing area. Please keep your camp site as small as possible to ensure that everyone will have sufficient space. Anyone that takes up more than what is considered adequate space, will be asked to lessen their footprint. RV's may not park in a way that will impede traffic or damage the environment. RV owners must be especially careful of interior lights. Please park so that doors open away from observers, block windows to prevent light trespass, and mask interior lights with red cellophane as necessary. Generators may run only from 11:00 a.m. until 8:00 p.m. There are no electrical or sewage hook-ups at Menghini Winery. Lasers and Laser Pointers: Green laser pointers will be permitted during the public outreach time of 7:00 to 10:30 p.m. on Saturday ONLY. The use of lasers and laser pointers (any color), except for collimation, is STRICTLY PROHIBITED at all other times. Thank you for your cooperation. Quiet Times/Active Locations: Not everybody sleeps at the same time. Many attendees observe from dusk until the wee hours of the morning. Please be courteous to your neighbors at all hours by minimizing noise. If you play music, play it quietly. On the other hand, please realize that your sleep may be disturbed by observers talking and using equipment as they stay up late. Locate your campsite accordingly. Door Prizes: A drawing will be held for thousands of dollars worth of door prizes on Saturday evening. A free ticket is included with each paid admission and additional tickets are available for purchase. You must be present in or around the main stage at the time of the drawing. Clean-up: When you leave, please make sure your area is trash free. Please leave Julian StarFest better than you found it. Parking/Driving: All vehicles and equipment must be off roadways, with adequate room for other vehicles, including large emergency vehicles to pass. Please be alert to pedestrians walking along the roadways, especially at night. Day use visitors will have a separate parking area. To preserve our night vision, no driving is permitted on the grounds (including the camping areas) after dark (exception: the public parking lot). Video and Photography: Many people make photos, video, and audio recordings. By entering the grounds, you grant permission for videos and photography, including rights to publication and broadcast of images and audio. Registration can be accomplished by mail or on-line using PayPal. Please see the instruction in the left hand column. Note: Day use does not require pre-registration. Admission to the Vendor / Exhibit area is $5.00 per adult, $2.50 for Teens (13 to 18) payable at the gate. Children, 12 and under are free. Admission for registered campers is included in their camping fee. Just show your wrist band for admission to the Vendor / Exhibit area. You only have to pay once for admission. Your wrist band will allow you entrance for both days of activities. And show your JSF Wristband in town for discounts at local merchants. and the Julian StarFest Twitter page. Copyright © 2008, 2009, 2010, 2011, 2012, 2013, 2014, 2015, 2016, 2018. All Rights Reserved. Documents on this site require Adobe Acrobat® Reader®. To download Adobe Acrobat® Reader®, click http://get.adobe.com/reader/. 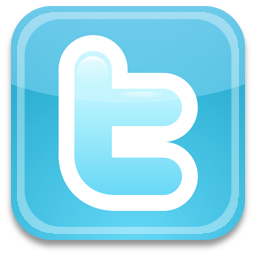 This link is made to assist in accessibility of .pdf files on this site. No endorsement or warranty of Adobe Acrobat Reader® or Adobe Systems, Inc., is implied or expressed.